An angry Brett Morris has slammed the under-fire Lottoland surface, saying he will be worried if he has to play at the suburban ground again. The Sydney Roosters winger is expected to miss two NRL rounds after suffering a partial MCL tear in his left knee in his side's 26-18 win over Manly. 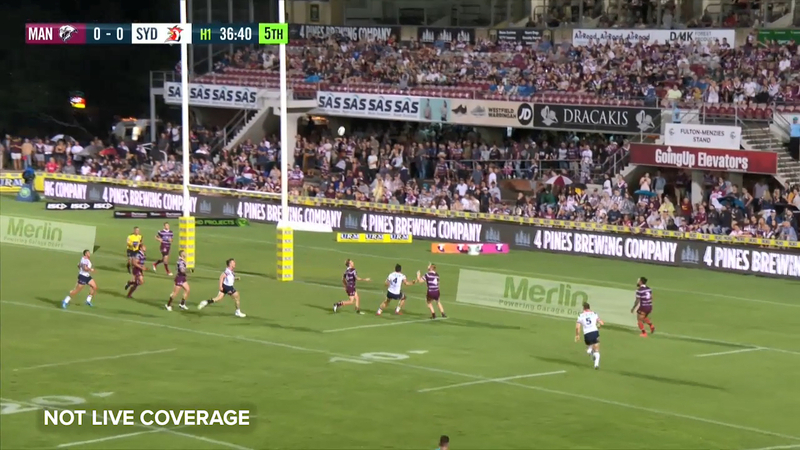 Morris' knee dug into the surface of the Sea Eagles' rain-soaked home ground on Saturday, sending a giant divot of dirt flying. The veteran back said he was wary of playing there after injuring his knee at the northern beaches ground while playing for Canterbury in 2015. At the time Morris jarred his knee after claiming his foot sunk into a 10cm pothole. He only missed a week but it resulted in complications, and he underwent surgery at the end of the year. Asked if he was angry, the usually mild-mannered Morris said: "I'd be lying if I said I wasn't. "If it was the first time it happened to me, I'd just brush it off. "But I've been to Brookvale twice and my knee's dug in and had an injury as a result. "As a player, you work so hard week in and week out to get out there and to have this happen as a result of the ground, it is frustrating." Torrential rain hit the ground during the first half and Manly CEO Lyall Gorman said the incident was a result of the downpour - a claim dismissed by Morris. "The first time I did it, it wasn't raining," Morris said. "We had rain at the SCG when we played Souths and I didn't see anyone's knees digging that far into the ground there. It's something for them to look at." Last year Manly's Curtis Sironen, Kelepi Tanginoa and Lachlan Croker suffered ACL tears at the ground and in 2017 Sea Eagles winger Jorge Taufua and Canberra's Dunamis Lui suffered ACL injuries in the same round 13 match. The NRL has requested an inspection of the ground and have said they will meet with Manly and the Northern Beaches Council. Morris stopped short of saying he would refuse to play at Lottoland again, but said the potential for injury would be playing on his mind. "From now on it will certainly be in the back of my mind, thinking about my safety, having past experiences," Morris said. "If a club lost a major player due to it, there would be a lot of uproar. Especially a club building their season, say if Newcastle went there and they lost Ponga, how would their fans and players react?"